Thank you for your interest in Belmond. Please note this is not a confirmed booking. You will be notified by email of the status of your request. Belmond La Résidence Phou Vao is home to some of the best Luang Prabang restaurants. Talented chefs weave a culinary spell in the kitchen, working fresh local produce into a fusion of Euro-Asian flavours. To keep things local, why not start the night with a Laotian whisky cocktail at the bar? 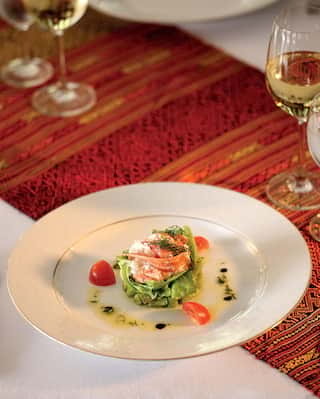 In the hands of our culinary team, inventive French cuisine is brought to life with delicate Laotian accents. Dine in the stylish interior, or head outside for superb views of Mount Phousi. By night, tree-hanging candles and lanterns bathe the gardens in an enchanting glow. With large armchairs and a laid-back, open-air lounge, Mountain Bar is an ideal spot for pre- or post-dinner drinks. Make yourself comfy in our elegant interior for a sophisticated evening with friends. Or take to the terrace––whisky sour in hand––to drink in one of Laos’ many spellbinding sunsets. Open daily from 1 to 11pm. Take your seat at a private table for two in our intimate UNESCO heritage garden. In the ambient glow of 500 candles, an unforgettable Laotian feast awaits. The flickering glow of 500 candles and enchanting sound of live Laos music set the mood for romance. Indulge in your choice of Laotian or Western live barbecue as a personal waiter caters to your every need. Highlights include tiger prawns with tamarind and cashew, and a velvety soft Mekong fish roll with tomato fondant and basil foam. An Asian affair to remember. Embark on a culinary journey and sample the irresistible tastes of Lao cuisine. Copyright 2019. All copyright and other intellectual property rights in all logos, designs, text, images and other materials on this website are owned by Belmond Management Limited or appear with permission of the relevant owner. 'Belmond' is a registered trade mark. All rights reserved.